Log on to Veeam Backup Enterprise Manager, using an account with the sufficient permissions. For more information, see Providing Access Rights. Go to the Items tab and click SQL Database. Enter a name of SQL Server hosting the database you need to restore; use the server_name\instance_name format. Alternatively, click the Pick from List link to select from the list of available SQL Server machine backups. Veeam Backup Enterprise Manager will try to use the account of the backup job that contains the SQL Server machine. If this account does not have sufficient rights to perform the restore procedure (for example, in case of imported backup), user will be prompted to provide the necessary credentials. 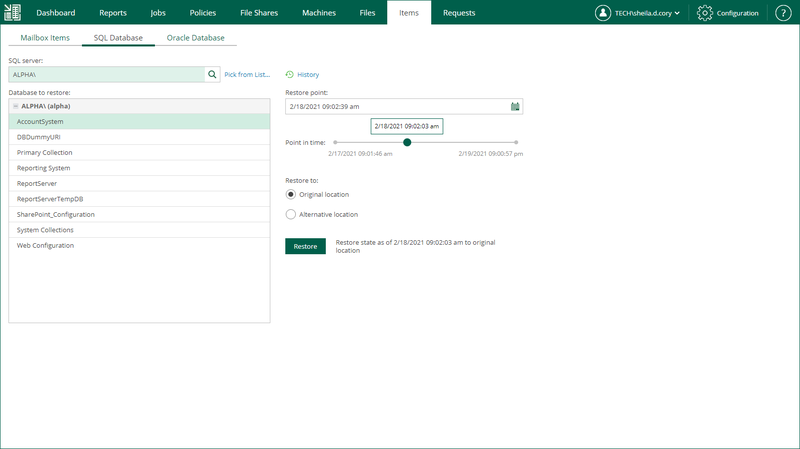 For more information on the account roles in Veeam Backup Enterprise Manager that allow the user to restore SQL databases, see Providing Access Rights. For more information on the possible restore scenarios, see 1-Click Restore to Original Location and Restore with Custom Settings.